The reformed CHASTAIN — featuring Leather Leone on vocals — has set "Surrender To No One" as the title of its comeback album, tentatively due in early 2014 via an as-yet-undetermined record label. Guitarist David T. Chastain and Leather Leone have been writing material since January. Also back in the saddle is original bassist Mike Skimmerhorn. The drum tracks for the CD were recorded by Stian Kristoffersen (PAGAN'S MIND, FIREWIND) since original drummer Fred Coury is still busy touring with CINDERELLA and other projects. 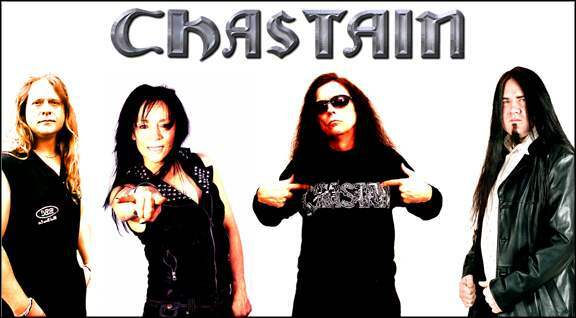 The Leather-fronted version of CHASTAIN recorded five CDs in the mid-to-late 1980s: 1985's "Mystery Of Illusion", 1986's "Ruler Of The Wasteland", 1987's "The 7th Of Never", 1988's "The Voice Of The Cult" and 1990's "For Those Who Dare". After the "For Those Who Dare" tour, David and Leather amicably went their separate ways but kept in touch over the years. Leather last year released the debut album from her SLEDGE LEATHER project, "Imagine Me Alive". The CD was inspired in 2010 when Leather called Sandy Sledge to collaborate on the Ronnie James Dio track "Egypt" for a demo tribute recording. Due to the overwhelming response for more material, SLEDGE LEATHER was born and was confirmed for Germany's Keep It True festival in April 2011. Regarding the new CHASTAIN material, David states: "We are trying to write and record music that is expected of us but with some modern twists and turns. We demoed up 20 tracks and it was difficult to leave any of them off the CD. Stian did an amazing job with the drum tracks and his performance is probably the best drumming on any CHASTAIN release to date. We have been in no rush as we wanted to make sure everything would live up to our past releases, but at this point we are in the home stretch." Leviathan Records in 2010 released "The Reign of Leather", a collection of CHASTAIN tracks Leather had a hand in writing during her glory days with the band. Leviathan also reissued two of the classic CHASTAIN CDs with Leather: "The 7th of Never" and "The Voice Of The Cult". Both were digitally remastered and are in their original unedited versions.